BCDB Rating: 3.4/5 Stars from 7 users. This page has been viewed 73 times this month, and 6127 times total. Cartoon Characters: Mickey Mouse, Donald Duck, Goofy, Minnie, Daisy, Pete, Clarabelle, The Troubadour, The Beagle Boys. Animated By Andries Maritz, Scott T. Petersen, Simon Alberry, Kevin Peaty. Written By David Mickey Evans, Evan Spiliotopoulos. Music: Bruce Broughton, Chris Otsuki, Scott Erickson. Originally Released on August 17, 2004. "The Three Musketeers," "Mickey's Three Musketeers (Working Title)," "Mickey, Donald And Goofy In The Three Musketeers (Working Title)." Premiered July 11, 2004 at Outfest 2004, the 22nd L.A. Gay and Lesbian Film Festival. Do you have anything to add to this page? 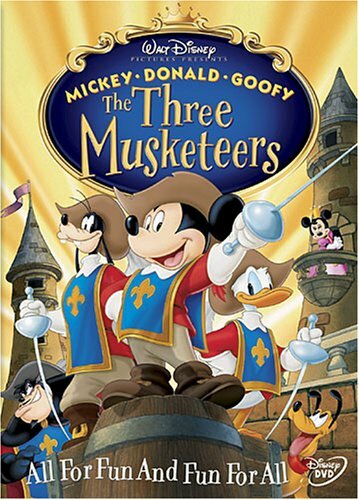 Have we made any mistakes... or do you have any additional information about Mickey, Donald, Goofy: The Three Musketeers? If so, we would love to hear from you. Please send us a quick note with your additions or corrections to this page, and we will make the corrections as soon as possible! 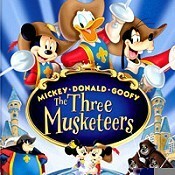 Do you love Mickey, Donald, Goofy: The Three Musketeers, or do you think it is the worst cartoon ever? Let us know what you think! Surely you have an opinion... so share what you think. Take a minute and post your own comments about this cartoon here. Mickey, Donald, Goofy: The Three Musketeers by Big Cartoon DataBase is licensed under a Creative Commons Attribution-NonCommercial-ShareAlike 4.0 International License.